Jason Segel is brilliant as Wallace, a highly intelligent individual who, like many tortured writers, battled addiction and depression. He plays Wallace with such depth and intensity that you can see the wheels turning in Wallace’s brain. I'm not quite sure how to describe The End of The Tour. So many adjectives come to mind, it's hard to know which ones to choose. The ones that jump out are intense, philosophical, poignant, introspective, intelligent, and slightly depressing. Based on a novel by David Lipsky, it tells the story of Lipsky's five day interview with acclaimed author David Foster Wallace, as he finishes his book tour for Infinite Jest, in 1996. Lipsky, then a writer for Rolling Stone Magazine, follows Wallace to Minneapolis to question him about his life, his work and his future. During their brief time together, the men form a bond fueled by intelligence, mutual respect, and perhaps, a little bit of jealousy. Lipsky delves into Wallace's psyche while the two share meals, cigarettes and life stories. Ultimately, the article for Rolling Stone was never published, but after Wallace's suicide in 2008, Lipsky depicts their conversations and travels in Although Of Course You End Up Becoming Yourself: A Road Trip with David Foster Wallace. One of the draws of this film is the cast. Jason Segel (How I Met Your Mother) is brilliant as Wallace, a highly intelligent individual who, like many tortured writers, battled addiction and depression. He plays Wallace with such depth and intensity that you can see the wheels turning in Wallace's brain and the sadness behind his eyes while he outwardly puts on a mask of confidence and contentment. Equally as impressive is Jesse Eisenberg (The Social Network) as Lipksy. He portrays the interviewer with a little cockiness that Lipsky doesn't completely possess, while maintaining a slight sense of awe and reverence for Wallace. Director James Ponsoldt (Shameless) adds a layer of haze to the meeting by shooting many of the scenes as if they were slightly out of focus. This element gives the audience a sense of the muddled and murky thoughts that lay in Wallace's brain. Additionally, a bonus for me was a 90's filled soundtrack which helps set up the film beautifully. 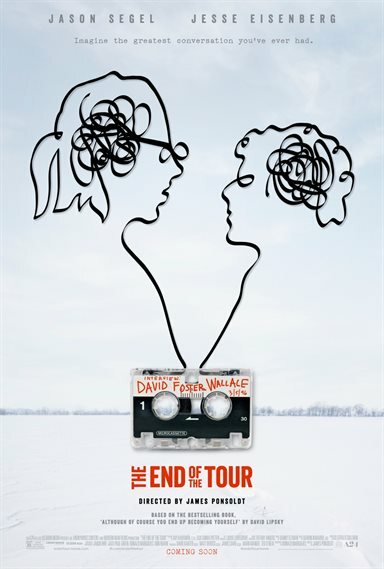 Download The End of The Tour from the iTunes Store in Digial HD. For more information about The End of The Tour visit the FlickDirect Movie Database.